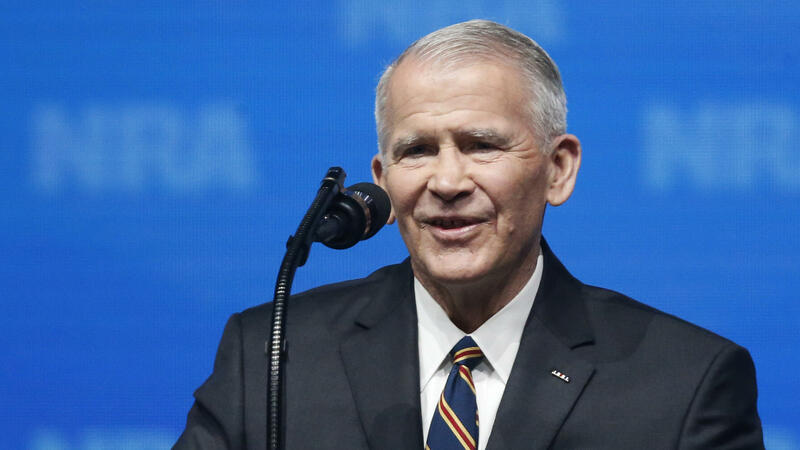 Retired U.S. Marine Lt. Col. Oliver North speaks before giving the invocation at the National Rifle Association Institute for Legislative Action Leadership Forum in Dallas on Friday. The NRA announced Monday that North will become president of the association within a few weeks. Retired Marine Lt. Col. Oliver North, infamous for his involvement in the Iran-Contra scandal in the 1980s, will be the next president of the National Rifle Association, the organization says in a statement. The process will take several weeks, time that North says he will use to "set his affairs in order." North says he is retiring from Fox News, where he has worked as a commentator and military analyst, effective immediately, according to the statement. On Monday morning, former NRA President Pete Brownell — chief executive of the firearm accessories company Brownells — announced that he was not seeking re-election, to spend more time with his family, the NRA says. The board of directors promptly moved to replace him with North. "This is the most exciting news for our members since Charlton Heston became President of our Association," NRA Executive Vice President and CEO Wayne LaPierre said in the statement. "Oliver North is a legendary warrior for American freedom, a gifted communicator and skilled leader. In these times, I can think of no one better suited to serve as our President." The Brady Campaign to Prevent Gun Violence released a statement in response to North's appointment. "Perhaps the NRA is feeling the pressure from the past few months to change their leadership — but it's downright baffling that they'd choose to install a walking lightning rod at the top of the organization," co-President Kris Brown said in the statement. "Oliver North's very name is synonymous with corruption and disgrace." North served in Vietnam, where he earned combat medals. In the '80s, he was an aide in the Reagan administration and a central player in the U.S. government's operation to secretly sell weapons to Iran and use the funds to support anti-communist Contras in Nicaragua. And afterward, he had a starring role in the televised hearings about the scandal. NPR's Ron Elving, reporting last year on Congress' history of high-drama hearings, pointed to an iconic moment in those lengthy Iran-Contra hearings. North "had done such a good job of lying to Congress in the past that a committee lawyer asked if North was still lying as he testified," Elving reported. North replied, "I am not lying to protect anybody, counsel. I came here to tell the truth. I told you that I was going to tell it to you — the good, the bad and the ugly." He was convicted of three felonies for his role in the affair, but those convictions were overturned by a federal judge in 1990. North went on to become a talk show host and made an unsuccessful U.S. Senate bid. North has been a member of the NRA's board of directors for years. And he is popular: Lifetime members of the NRA can cast votes for members of the board of directors, and North has repeatedly been the top vote getter. The NRA just wrapped up its annual meeting, which was held in Dallas. The private organization has been the subject of intensifying protests and public pressure after survivors of the Marjory Stoneman Douglas High School shooting in Parkland, Fla., began organizing to protest gun violence.